The region of historical Banat covered a surface of approx. 28.500 km². After the post-World War I peace treaties, 18.700 km² lie in Romania, 9.300 km² in Serbia and the remaining 270 km² in Hungary. Historical Banat is bordered to the north by River Mureș, to the west by Tisza and by the Danube to the south and by the Carpathians to the east. Traditionally, Banat is divided into the Banat Mountains in the east and southeast. 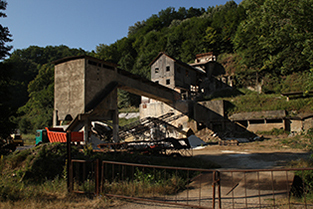 The region is rich in ore – therefore is often called “Banat Ore Mountains” – and once was, through the help of massive German settlement, the most industrialised region in southeastern Europe. The Banat Hillands – also called “Banat Hedge” – slope amphitheatre-like to the west. The region is unique through its German colonial settlements in direct neighbourhood to Romanian, Serbian, Ukrainian and Bulgarian villages and the fact that the ethnological-linguistic and religious frame of mind have been largely preserved. The last part of Banat to the western border of Romania, Hungary and Serbia is called “Banat Moorland”, a fertile plain with thick layers of black earth, which gave the region the reputation of being the “granary” of middle Europe. The fall between this part of Banat towards the Tisza is very little: the altitude difference between the Banat plain in the east and the west– approximately 200 kilometres – is only 25 metres. Therefore, drainage of natural waters has been a problem well into the 18th century, turning Banat into a large marshland that could only be turned into fertile ground after a process of drainage and river regulation. Today’s Banat is shaped by its cultural landscape. The natural vegetation has only been maintained in small niches worth of preservation such as the gallery forests listed as natural monuments or the remaining woods in the Banat plain like the hunting-woods in Timișoara. Many Banat streets are lined with alleys which cast refreshing shade in the summer. Unfortunately, mulberry trees, the characteristic wayside trees of Banat, have been lumbered more and more often. The settlements of Banat are influencesd by the middle-European mercantilism of 18th century colonisation. Compact settlements are predominant up to the mountainous areas and have replaced dispersed settlements. After the scientific findings during Josephinist Enlightenment, many hamlets were built in check-board design with great attention to hygiene care (such as wells for clean water, doctors’ quarters, bull- and boar stables, etc.). On the other side of the range, mountain settlements with their own characteristics were built. Today, many of them have been ruthlessly reconstructed and turned into popular holiday residences, thereby bringing a new profession to the crisis-shaken region: house guard and dog carer for the holiday residents. Timişoara with its 290.000 inhabitants is the capital of Banat (German: Temeswar: Serbian: Temišvar, Hungarian: Temesvár). As a metropolitan region, Timişoara comprises 500.000 inhabitants. 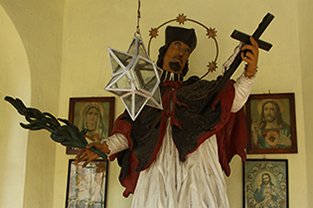 Saint John of Nepomuk, patron saint of Banat. 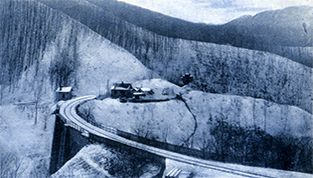 From here, the ores were transported on lorries on a ropeway to Bocșa .